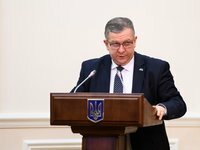 Minister of Social Policy Andriy Reva has said that more than 3.2 million Ukrainian citizens are employed abroad on a permanent basis. "More than 3.2 million Ukrainian citizens work abroad on a regular basis," Reva said at the launch of the project to improve the management of the labor market dubbed "Inclusive labor market for jobs in Ukraine" in Kyiv on Tuesday. He also noted that labor migration is currently seasonal. "According to our estimates, up to nine million Ukrainian citizens take part in this process," the minister added.